What have you been doing since graduation, e.g. employment, education, family, etc., and any future goals. I’m in my fourth year of teaching at Wheaton Area Schools. It is a small school district. I teach a wide variety of classes: life science 7, earth science 8, physical science, biology, chemistry, and college biology. I put in a lot of hours rebuilding our science curriculum, but it is worth it. I’ve been involved in implementing technology at our school (1:1 ipads) and have taught many co-workers on how to use SmartBoard (Thanks Dan Moos!). I also coach cross country and assist in the track program. I’m currently getting my masters in biological sciences through Clemson University. 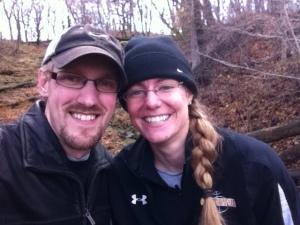 I enjoying hiking (our goal is to visit every MN State Park) and canoeing with my husband Leif.